Hot on the DAP heels again after catching them with their pants down lying about the tunnel consultancy fees. Now, we go back to the question of the validity of the CEC. 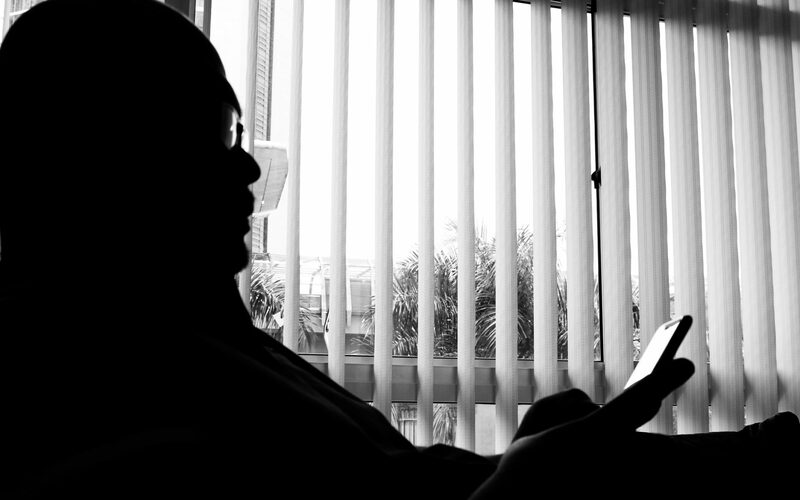 The DAP’s illegal CEC knew since April 2013 that they were appointed illegally according to their own party constitution and could therefore not be recognised by the Registrar of Societies. 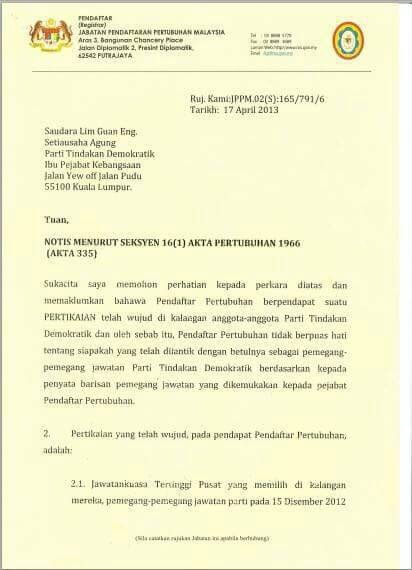 Here is a copy of the letter from the RoS to the Tokong. In Paragraph 2, the RoS had already stated its reason for believing that the CEC cannot be recognised by the DAP as the manner in which the members were elected to the CEC contravened Clause X Item 1 of the DAP constitution. 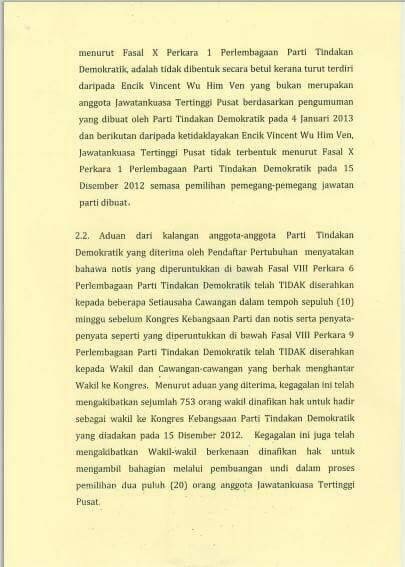 This is because the CEC included Vincent Wu who, according to the announcement made by the DAP on the 4 January 2013, was not eligible to become a member. 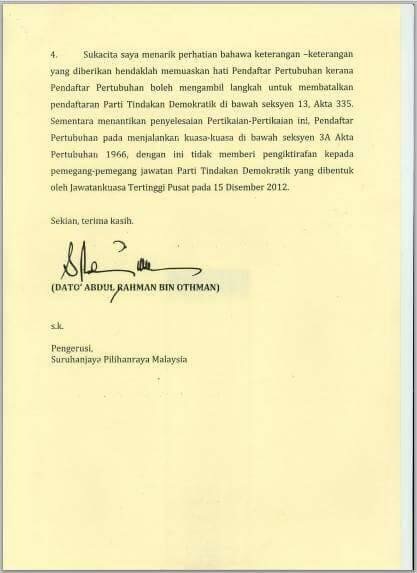 In Paragraph 2.2 it is also mentioned that members complained about not receiving the notice of meeting TEN weeks before the party’s national congress was held as required by Clause VIII Item 9 of the DAP constitution. This resulted in 753 delegates having their right to attend the congress denied by the party’s manahement, and denied their right to vote for the 20 CEC members. The RoS stated in Paragraph 3.2 that the notice to the branch secretaries should have adhered to Clause VIII Item 6, while notice to the delegates should have adhered to Clause VIII Item 9 of the DAP constitution before the 15 December 2012 national congress. Therefore, in order for the RoS to recognise the legitimacy both Clauses mentioned would have to be fully complied with before a fresh congress and election could be held. 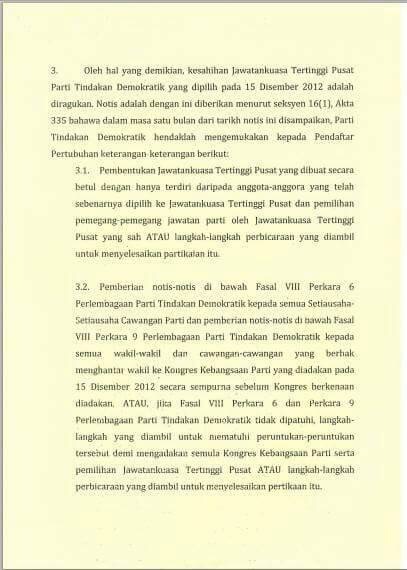 In the last paragraph, the DAP was given a stern reminder by the RoS to comply with all the requirements of the RoS which were based on the DAP’s own party constitution, failing which the RoS could take action to de-register the party as provided for via Section 13 of the Societies Act, 1966. In waiting for compliance, the RoS refused to recognise the legitimacy of the CEC formed after the 15 December 2012 national congress. And what has the DAP done to comply with its own party constitution as required by the RoS since then? DAP members should put the blame on only the Tokong and his brutes in the CEC that is not only illegal, but also a farce and a sham.